Makgeolli is the oldest known alcoholic beverage in Korea dating as far back as the Koryo dynasty. Until recently, it was a drink that was associated with grannies and old people in general. It is usually made from rice but other grains such as wheat, barley and malt can be used. Some people or brands even use a mixture of different grains. Flavours such as ginseng, apples, chestnut and corn are sometimes added to the brew to improve and give variety to the taste. 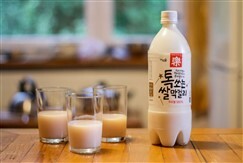 The health benefits of makgeolli are numerous. It is unfiltered so it contains high amounts of lactic acid and the helpful bacteria found in yoghurt. It only contains 6-8% alcohol compared to other alcoholic drinks. Makgeolli aids digestion, improve immunity and is said to slow down the ageing process. Makgeolli should be shaken or stirred before consumption, as it tends to settle leaving the white portion at the bottom and a pale yellow liquid at the top.It is commonly served as an accompaniment to Korean pancakes such as pajeon and bindaetteok. Makgeolli and it's cousin, dongdongju, are some of my favorite Korean alcohols. It's not as high in alcohol as most sojus, it's not as filling as beer, and the flavors are wide and varied. Plus it has live cultures! There is honestly nothing I don't love about it. I recommend the traditional ones, but also don't hesitate to try the flavors (chestnut, or "밤," being a favorite).